To reach the Richardson Cemetery, from Florence, Alabama travel Alabama Highway 20 west for 3.3 miles. Turn left (west) onto County Road. 14 (Waterloo Rd.) and travel to Waterloo, Alabama. Turn left at the 4-way stop and go through the town of Waterloo to the turn-around at the river. Turn up the hill to the right and the cemetery is on the left of the road. A smaller section is also on the right side of the paved road after reaching the crest of the hill. The two graves listed below are on the south side of the road next to the river. They are not in the main cemetery. The survey of this section started at the eastern end where the very tall monuments are. Every effort has been made to record the rows accurately. 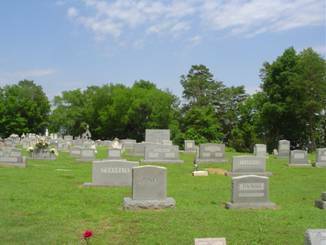 As in most all cemeteries, the rows are out of alignment in some areas. The Julia A. Richardson in this section is listed on the large monument with her husband, but she is actually buried in Row 5. According to Mrs. Emma Scott, who has since passed away, Hiram Richardson’s mother is reportedly buried with him. I have not found the information pertaining to her. 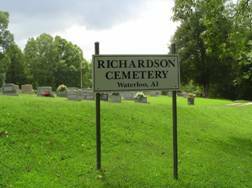 NOTE: Julia A. Richardson is actually buried in Row 5 and not with her husband Hiram. Turner, Martha J.; b. 24 Feb 1843, d. 29 Dec 1906, wife of S.P. Turner, S.P. ; b. 11 Nov 1836, d. 31 May 1922, husband of Martha J.
Richardson, Cora A.; b. 1878, d. 1928, wife of John W.
Richardson, John W.; b. 1867, d. 1922, husband of Cora A.
Humphrey, infant; b. 12 Jan 1920, d. 14 Jan 1920, son of A.V. & L.S. Higgins, Martha E.; b. 13 Jul 1861, d. 25 Dec 1946, wife of D.C.
Webb, Noble; b. 14 Apr 1897, d. 25 Nov 1900, son of M.P. & S.A.
Webb, S.A.; b. 1857, d. 12 Jul 1910, wife of M.P. Higgins, Clarence W.; b. 13 Oct 1884, d. 19 Dec 1885, son of D.C. & M.E. Sullivan, infant; b. 08 Aug 1907, d. 13 Aug 1907, daughter of James Y. & Dora L.
Sullivan, Carrie Maye; b. 17 Nov 1901, d. 08 Aug 1902, daughter of James Y. & Dora L.
Scott, Rufus G.; b. 27 Nov 1837, d. 04 Aug 1907, husband of M.A. Higgins, Olen; b. 14 Oct 1870, d. 19 Jan 1902, son of R. & E.F.
Higgins, Zack A.; b. 19 Mar 1877, d. 18 Sep 1910, husband of O.E. Haynes, Sarah; b. 06 Mar 1866, d. 29 Oct 1896, daughter of J.W. & C.T. Haygood, Verie S.; b. 14 May 1898, d. 01 Jul 1898, daughter of W.D. & M.E. Threet, L. Gaines; b. 1864, d. 1953, husband of Harriet D.
Haynes, Addie; b. 04 Nov 1854, d. 01 May 1937, wife of J.H. Higgins, infant; b. 29 Apr 1908, no death date son of Mr. & Mrs. A.D.
Emerson, Laura J.; b. 18 Jul 1872, d. 08 Dec 1935, wife of Samuel H.
Emerson, Samuel H.; b. 05 Aug 1855, d. 05 Apr 1924, husband of Laura J.
Emerson, William M.; b. 20 Nov 1901, d. 04 Oct 1909, son of Samuel H. & Laura J.
Emerson, Stanley H.; b. 03 Jan 1885, d. 26 Mar 1905, son of Samuel H. & Laura J.
Mangum, Artie M.; b. 04 Apr 1908, d. 16 Mar 2004, wife of 1st husband Hubert R., Artie is buried with 2nd husband Gordon G. Boatman in row 24 of this section. Bevis, F.M. ; b. 26 Apr 1855, no death date, husband of C.J. Bevis, C.J. ; b. 25 Feb 1859, 05 Jan 1932, wife of F.M. Gean, Gleen W.; b. 31 Dec 1921, d. 14 Jan 1923, son of G.W. & F.M. Seaton, Hubert W.; b. 16 Mar 1922, d. 27 Nov 1922, son of Jesse Chalmer & Edna W.
Shepard, M.J.; b. 02 Mar 1867, d. 21 Dec 1944, wife of T.A. Shepard, T.A. ; b. 09 Jun 1864, d. 26 Jun 1929, husband of M.J.
Steely, Neil A.; b. 18 Nov 1885, d. 13 Jan 1973, husband of Ida H.
Steely, Ida H.; b. 22 Mar 1885, d. 09 Feb 1964, wife of Neil A.
Hinton, William A.; b. 1884, d. 1961, husband of Dora C.
Hinton, Dora C.; b. 1887, d. 1971, wife of William A.
Hinton, Stella; b. 10 Sep 1914, d. 07 Aug 1915, daughter of William A. & Dora C.
Hinton, Walker; b. 13 May 1910, d. 26 Aug 1912, son of William A. & Dora C.
Scott, Charlie T.; b. 25 Sep 1872, d. 23 Oct 1949, husband of Nancy E.
Scott, Nancy E.; b. 10 Oct 1870, d. 16 Apr 1942, wife of Charlie T.
Scott, Margaret; b. 18 Apr 1901, d. 20 Apr 1918, daughter of Charley T. & Nancy E.
Scott, Arthur; b. 07 Oct 1906, d. 18 Apr 1918, son of Charley T. & Nancy E.
Allen, Julia G.; b. 17 Jan 1848, d. 29 Jun 1913, wife of James M.
Tucker, Sallie C.; b. 12 Dec 1853, d. 13 Apr 1933, wife of Oliver P.
Tucker, Oliver P.; b. 20 Feb 1840, d. 07 Jun 1910, husband of Sallie P.
Tucker, L.J. Beulah; b. 31 Oct 1874, d. 29 Nov 1878, daughter of Oliver P. & Sallie C.
Higgins, Grace; b. 1911, d. 1996, wife of William B.
Richardson, Jessie E.; b. 26 Jul 1880, d. 14 Sep 1962, wife of Hiram T.
Richardson, Hiram T.; b. 14 Oct 1872, d. 12 May 1952, husband of Jessie E.
Richardson, Little Joe; b. 17 Dec 1916, d. 18 Jan 1919, son of H.T. & J.
Humphrey, Sarah Adaline; b. 13 Sep 1832, d. 06 May 1921, wife of Jno. T.
Sego, Maggie J.; b. 02 Mar 1872, d. 15 Dec 1949, wife of James A.
Sego, James A.; b. 05 Sep 1868, d. 21 Dec 1935, husband of Maggie J.
Sego, Johnie; b. 19 Oct 1908, d. 08 Dec 1912, son of James A. & Maggie J.
Higgins, R.F. ; b. &d. 18 Sep 1928, infant of F.M. & R.F.H. Higgins, E.V. ; b. 22 Oct 1928, d. 12 Nov 1928, infant of F.M. & R.F.H. Higgins, Mary S.; b. 08 Apr 1919, d. 04 Apr 2007, wife of Richard C.
Franks, Rethel M.; b. 20 Sep 1922, d. 10 May 2000, wife of Louis I.
Franks, Louis I.; b. 28 Aug 1906, d. 10 Dec 1989, husband of Rethel M.
McCorkle, Lula D.; b. 03 Jan 1863, d. 26 Nov 1865, daughter of T.T. & L.E. Austin, S.A.; b. 28 Jan 1855, d. 17 Feb 1929, husband of Mary E.
Austin, Mary E.; b. 24 Dec 1857, d. 09 Jan 1935, wife of S.A.
Weston, Ellis E.; no dates, son of Jewel M. & Miles R.
Weston, Susie C.; no dates, daughter of Jewel M. & Miles R.
Moore, Betty Jean; b. 13 Sep 1933, d. 22 Feb 1935, daughter of E.H. & B.M. Faulkner, Johnie; b. 16 Nov 1905, d. 07 Feb 1929, son of R.E. & N.T. Lee, Ben; b. 08 May 1881, d. 14 Dec 1962, husband of Rosa H.
Boatright, Hoyt; b. 26 Jul 1920, d. 13 Jul 2010, husband of Bessie A.
Boatman, Gordon Granville; b. 28 May 1915, d. 10 Apr 2009, husband of Artie S.
Franklin, Mary Virginia; b. 15 Mar 1924, d. 16 Sep 2008, wife of Deward H.
Franklin, Joyce M.; b. 08 Sep 1937, d. 13 Aug 2016, wife of Lynn J. Barrier, Barbara J.; b. 17 May 1940, d. 13 Dec 1998, wife of Charles E.
Barrier, Charles E.; b. 13 Nov 1939, d. 15 Feb 1990, husband of Barbara J. Barrier, Henry O.; b. 27 Feb 1920, d. 04 Apr 1980, husband of Lady M.
Robertson, John H.; b. 26 Apr 1924, d. 19 May 2012, husband of Laura L.
Scott, Garnette; b. 06 Feb 1923, d. 28 Feb 2008, wife of James D.